A two-day Club Licensing Workshop was held at the CIFA headquarters which was attended by all staff members. The workshop demonstrated on how to strengthen the national league, how to improve clubs who are at the bottom without raising questions whether the league is good or not? FIFA Club Licensing consultant Robbie Middleby and OFC Competition Manager, Chris Kemp was on hand to provide the background on club licensing, showing how club licensing can improve the national league and club teams. 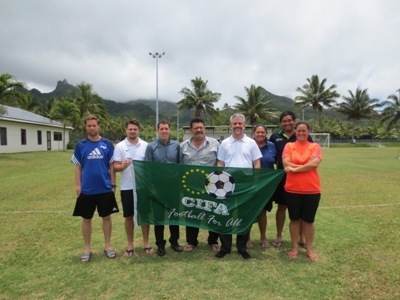 “We organised this workshop to raise awareness about the importance of club licensing and the benefits it brings to club football, especially as a development tool for national football in the Cook Islands,” Kemp said. FIFA’s Club Licensing System is based on five key criteria – sporting, personnel and administrative, financial, infrastructure and legal – which all aim to safeguard the credibility and integrity of club competitions while improving the level of professionalism. Implementation of club licensing, lifts the level of club management and the quality of the bottom club is lifted and increases the quality of the league overall. Furthermore, fans increase, sponsors increase and from the perspective of the national team, the level is also raised. Club Licensing is about regulation and development. For clubs in the Cook Islands they will find this challenging but achievable. Middleby outlined several criteria where Club Licensing raised the bar and had immediate flow-on effects in improving standards in National Leagues in UEFA. “Sporting criteria, we can see at how many C License coaches exist in a country. An association can support clubs by increasing the number of courses to produce more qualified coaches”. “Infrastructure criteria, in some associations there are not many facilities so what should be sought is local government support”. “Not all the criteria is easy, you will have some unique criterias, some criteria is difficult to fulfil. It takes time. Some criteria like legal it doesn’t require huge cost, it doesn’t take much time, if you have sufficient understanding of the process”. Club Licensing provides a link between National Club Licensing and competitions at Confederation level and encourages the implementation. Club Licensing is a long-term project being embarked upon globally and OFC aims to adopt the regional standards before the end of 2016. The guidelines will then be tailored to suit the needs of national associations and clubs.